This is an instant download PATTERN to make your own quiet book. You can DOWNLOAD and print the pattern after purchase. The pattern also includes a STEP BY STEP TUTORIAL with lots of photos and instructions to make this quiet book. I've translated everything into English (I'm Dutch). 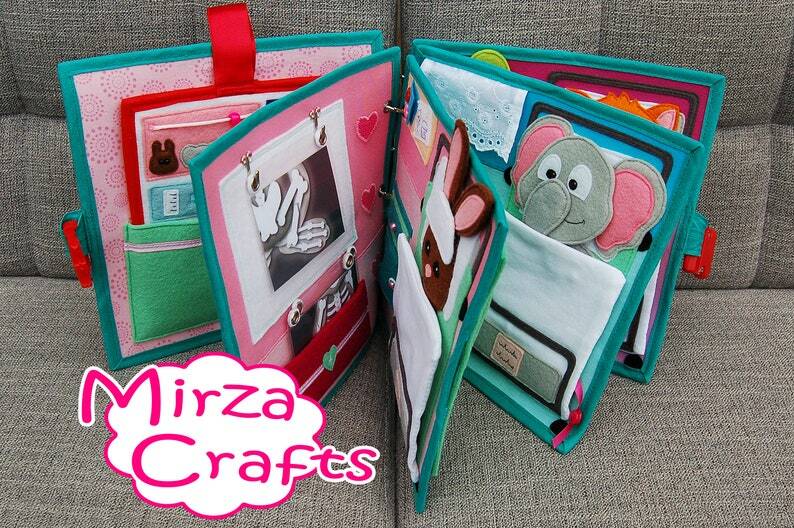 It's so much fun to make a quiet book for your little one and so special to see your baby play with it and treasure it! The quiet book pages measure 22 x 22 cm. - Front: Stethoscope with squeeker, syringe and peek-a-boo band aid. - Page 1 and 2: You can fill in the patient card for every patient! Which animal, length, weight enz. Find the animal patients in the hospital behind tree leafs, doors and windows... and find the ambulance! - Page 3 and 4: The bunny has broken bones! Hang the x-rays on the wall to see which bones are broken and give your bunny plaster! See inside the locker which food the bunny likes and read the card on the wall! - Page 5 and 6: This elephant is not feeling well! In the cabinet you'll find different faces for the elephant so change them as much as you like! In the cabinet are also medicine bottles to cure your elephant. Find the right place for every bottle. Find the butterfly behind the curtain, explore the flaps on the elephant body and take a look inside the locker what this elephant likes to eat! - Page 7 and 8: This cat is pregnant with twins! Wrap the kittens and put them in their little beds and feed them with the bottle! Play with the balloons and open the locker to find out what this cat likes to eat! A quiet book is a very special gift to a child. It has wonderful colourful pages with activities and challenges a child can play with and learn. It's so much fun! Your little one can play with it at any time, alone and together with you. Take it with you anywhere to have a little piece of entertainment with you! A wonderful and unique book they can treasure for their whole life! This pattern is for personal use only. Mass production, re-sale and distribution of pattern, photos and instructions is expressly prohibited. Please do not sell this quiet book or any other items made from this pattern ONLINE. By purchasing this pattern you agree to these terms. Listing is for the instant download pattern only and does not include pages and dolls. Have purchased many books. Very pleased with all. So cute! Thank you! I look forward to starting on this.